"What fun -- serious fun...a great event!" -- Gloria Steinem about Ripe Time's CLARISSA DALLODAY. 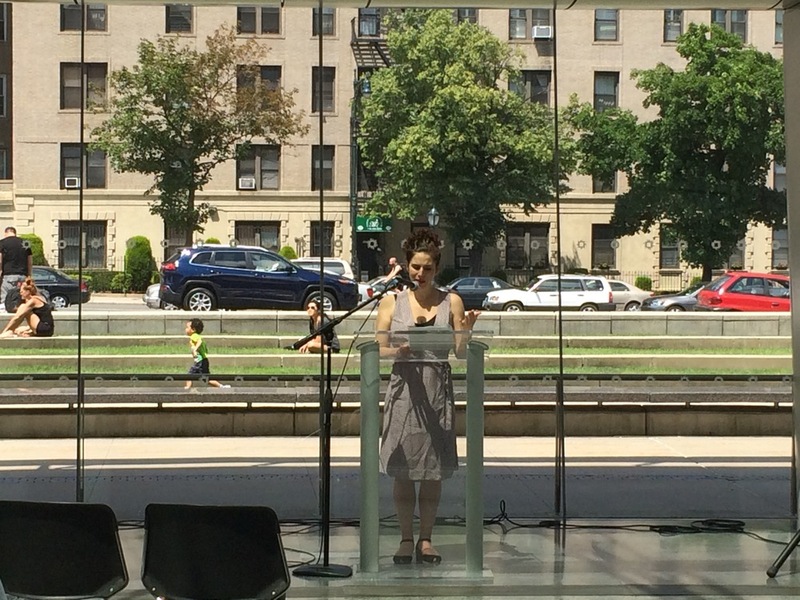 Hosted by the Brooklyn Public Library and Kathleen Chalfant, Ripe Time celebrates Virginia Woolf's masterpiece with a marathon reading of Mrs. Dalloway, starting at 6:30 pm on June 17th, 2015 at Kathleen's home in Brooklyn Heights and continuing on Saturday, June 20 at 12 noon on the steps of the Brooklyn Public Library. NOTE: In case of rain, just step inside the library and head to the Dweck Auditorium, where the show will go on! CLARISSA DALLODAY is an eight-hour immersion into Woolf’s masterpiece Mrs. Dalloway. Readers in 2015 include Tom Nelis, Kathleen Chalfant, Barbara Weichmann, Morgan Jeness, Shanga Parker, Kyra Miller, Antoinette LaVecchia, Paula McGonagle, Kea Trevett, Maiken Lozano-Wiese, Paco Lozano-Wiese, Jes Bedwinek, Erin Badenhop Moncada, Nick Chris, Angie Tennant, Megan Maloney, Maria-Christina Oliveras, Julia Hochner, Yana Landowne. Like Mrs. Dalloway, James Joyce's Ulysses chronicles a day in the life of its protagonist, Leopold Bloom as he moves through the streets of Dublin. June 16 is commonly known as Bloomsday, a day in which people around the world commemorate the work of Joyce. As a company devoted to promoting the words of women writers on its stage, and one with a deep relationship to that text in particular, Ripe Time is marking one day in June now as a landmark date for a celebration of Woolf: CLARISSA DALLODAY. To sponsor a reader, please click below. Those who sponsor a reader for at least $100 are entitled to admission to the VIP reading and reception at the home of award-winning actress Kathleen Chalfant on June 17th. See you on one fine day in June!